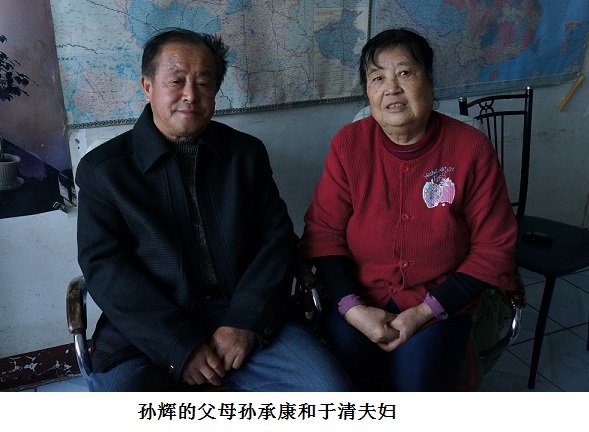 In mid-November 2013, Guo Liying and I traveled to Henan, Hubei, and Jiangxi Provinces in central China to visit the families of victims of June Fourth. We went first to Zhengzhou in Henan to visit Mr. Sun Chengkang and his wife Mrs. Yu Qing, the parents of Sun Hui, who was a first year student at Peking University when he died on June 4, 1989. The Suns now live with their daughter. It took us just over two hours to get to Zhengzhou from Beijing by high-speed train. As we walked out of the train station, we saw Mr. Sun, his wife, and their daughter Sun Ning waiting for us. When we saw each other, we all felt that we should have met a long time ago. We all embraced warmly. On our way to the Suns’ home, every time we mentioned Sun Hui, Sun Ning could not help crying. We could see she is someone with deep feelings. Sun Hui was the youngest of the Sun’s three children, and also the most loved by his parents. The Sun’s family home is on the fourth floor of a building facing the street. Mrs. Yu Qing’s legs are not very agile. Walking up the stairs every day is very difficult for her, and she has to hold on to the rails. In the afternoon, Guo Liying and I recorded an interview with them. Sun Hui’s parents Mr. Sun Chengkang and Mrs. Yu Qing. This family of three left their hometown in China’s Northeast without any hesitation. The couple’s daughter Sun Ning and youngest son Sun Hui were born in Ningxia. Though life for this family of five was hard, the couple had a harmonious relationship, and their children were all smart, well-behaved, and good students. They were a family full of love and warmth that was admired by all. The three children all tested into university. The older son attended Ningxia Medical College and is now president of a hospital in Ningxia. Their daughter went to Shenyang Architectural Institute of Technology, and now runs her own gardening and horticulture production company. She is a mother of two. They always took great pride in their youngest son Sun Hui. He was an extremely smart boy and had always been a top student at school. When he was in his second year of high school, Mr. Sun suggested that Sun Hui take the university entrance examination to assess his academic level. He passed the exam and was admitted to Ningxia University. But he told his father that he wanted to spend one more year in high school so that he would be good enough to go to Peking University. Mr. Sun thought that his son had a point. He was still young and it would be great if studying for one more year would enable him to go to Peking University, one of China’s top schools. And it is in the nation’s capital, where all Chinese people wanted to be. Going to Beijing would also enable him to see more of the world. Mr. Sun agreed with his son. Sun Hui did not disappoint. He passed the entrance exam the following year and was admitted by the Department of Chemistry of Peking University, becoming a student in the entering class of 1988. At around 8 a.m. on June 4, 1989, Sun Hui got on his bicycle, left the university, and sped toward Tiananmen Square. He was entrusted by his classmates to look for their class monitor and a few other classmates, who had not returned to school after the students withdrew from the Square in the early hours of June 4. When he arrived at the Fuxingmen overpass, he ran smack into the martial law troops who were shooting madly at the crowds. He was not able to dodge the bullets. An evil bullet entered his left armpit, pierced through his heart, and went out his right armpit. He fell to the ground, his blood staining his t-shirt which was emblazoned with the characters “Peking University.” Afterwards, people commented that perhaps it was his eye-catching t-shirt that made him a target of the martial law troops. The troops sent into the capital to carry out the martial law were told that their mission was to quell the “riot” started by the university students in Beijing. “A few days later, we received a letter from Sun Hui’s classmates and a notice from his school. I went to his school with my sister, my daughter, and her classmates. When I saw his body in the freezer, my heart hurt so much. I had sent my son to study in the capital under the leadership of the Communist Party so that he could be nurtured and become a good person who would contribute to the building of the country. But instead, he died by the guns of the Communist Party. This is the greatest regret of my life and something that I can never accept. “My boy was so smart that he could already pass the university entrance examination as a sophomore in high school. He also spoke good English and could communicate fluently with his foreign friends in Beijing. Another thing I regret is that he got into a school in Beijing. If he had attended other schools, this would not have happened. “After I settled my son’s affairs, I returned to the coal mine. After some time, my neighbor told me that the local police station had asked them to watch our every move. I really couldn’t understand why they had to do that. They shot dead my son, and now they made us their surveillance target. 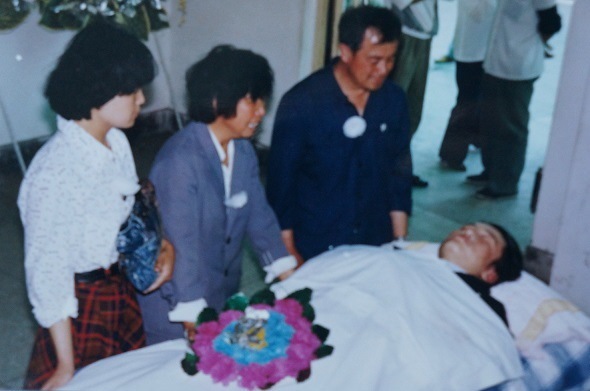 Sun Chengkang, his younger sister and his daughter pay their last respects to Sun Hui. “What about you?” I asked Mrs. Yu Qing. “Next year will be the 25th anniversary of June Fourth. What do you expect the government to solve for us? How do you feel about the series of memorial events?” asked Guo Liying. “Do you think the June Fourth massacre is a crime or a mistake?” I continued to ask, following up on Guo Liying’s topic. “It’s a crime!” Mrs. Yu Qing said in a firm voice. “They’re doing this to maintain stability and bolster political power. Do you feel that massacring people can solve problems?” I asked. “More than 20 years ago they used massacre. Many people became scared and didn’t dare to utter a sound. But in our hearts we refuse to accept this. The stronger the oppression, the more powerful the resistance is. When conflict intensifies to a certain degree, it will explode sooner or later,” Sun said. The Ningxia Hui Autonomous Region is in northwestern China. Looking for June Fourth Victims is an unofficial translation of 《寻访六四受难者》, published in 2009, in Chinese only. Translator’s note: Mr. Sun was likely referring to the Laoshan Cemetary near the Babaoshan Revolutionary Cemetary. The latter is reserved for high-ranking officials. Translator’s note: The annual sessions of the National People’s Congress and the Chinese People's Political Consultative Conference. You Weijie (尤维洁) and Guo Liying (郭丽英) are members of the Tiananmen Mothers. Sun Hui (孙辉), 19, male, a student in the Department of Chemistry at Peking University. 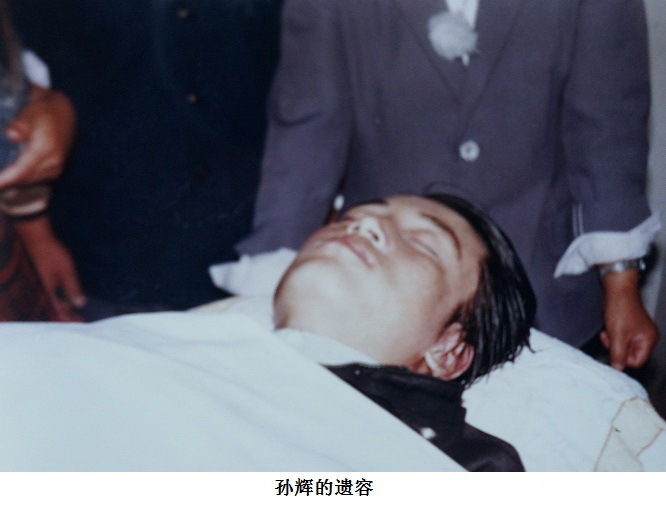 Shot to death in the early morning of June 4, 1989, near Fuxingmen. He was looking for his schoolmates after they had been dispersed by martial law troops.